Tai and Jacob met through mutual friends while hanging out on Beaver Lake. They instantly hit it off and have been inseparable ever since! Several years after they met, Tai and Jacob took a romantic trip to Paris. Instead of choosing one of the typical Paris locations to propose, Jacob waited for a private moment while they were walking alone. It was perfect! The overall theme for Tai and Jacob’s wedding was “fun and fabulous”. Tai chose the 21c Museum Hotel for the venue for their wedding. The 21c Hotel is located in downtown Bentonville, just off of the square. It is one of the area's top up and coming wedding venues and is perfect for brides seeking a sleek, modern, and glamorous wedding. 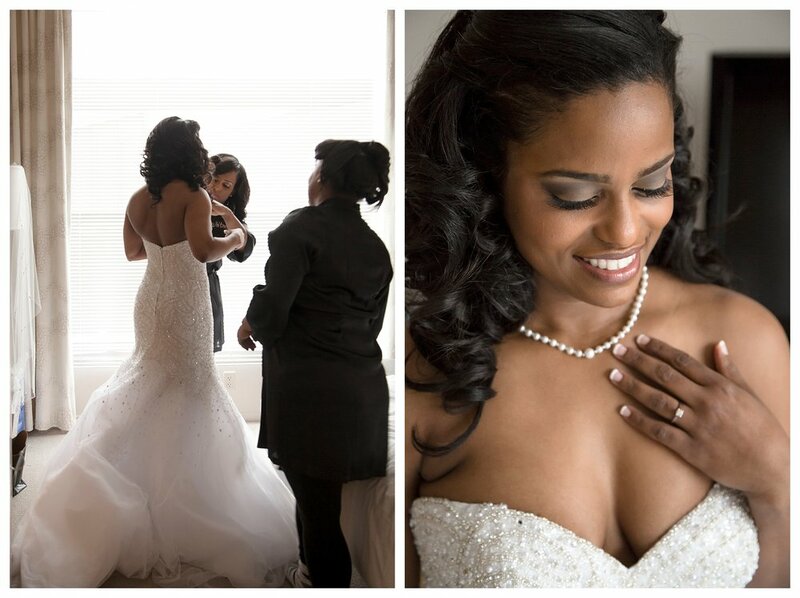 Tai and her girls got ready in one of the high-style suites sipping on wine and gazing at some of the amazing art to ward off any pre-wedding jitters. Tai wanted to include her favorite color, pink, and Jacob wanted to wear navy. They decided that with accents of white and gold, navy and pink would be perfect together! Jacob and Tai's sisters all wore floor-length pink bridesmaid dresses and had glamorous all white bouquets. The groomsmen wore gray suits with white button up shirts and all wore different bow ties. Jacob dressed in a striking navy suit with a multi colored floral tie and a yellow and navy pocket square. His look fit his personality perfectly! Everyone looked great, but Tai was a notch above! She was stunning in her english net and organza mermaid gown from Allure Bridals (Style C286). The bodice of her dress was completely covered in tiny sparkling gems which gradually flowed onto the skirt. She was a sight for sure! Tai also had a beautiful dress to change into for the reception. It was an ivory floor length satin dress with a large bow flowing down the back. 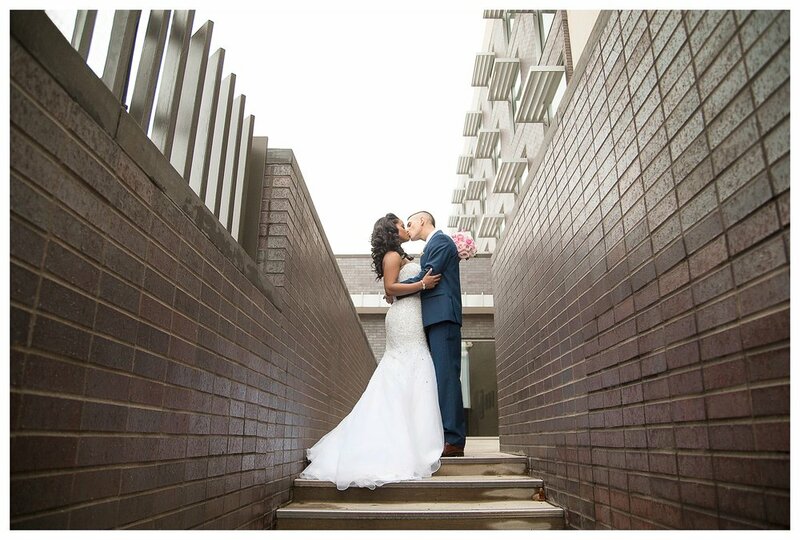 Tai and Jacob's wedding ceremony took place at Lawrence Plaza which is right around the corner from 21c. They decided to set up the chairs at the plaza in a circle so that Tai and Jacob would get married literally surrounded by those who love them. Tai walked down the aisle to a string quartet and stood with Jacob in a ring of pink rose petals to say their vows. It was glamorous and perfect! Tai and Jacob's wedding celebration continued inside the 21c Hotel with a light up dance floor, caricature artist, and an amazing hookah lounge out on the patio! Check out Part Two of Tai and Jacob's wedding here!